Adopted with advanced clipping device. 1. Films are easily to be inserted , taken out, and clipped firmly. 2. The frame of body is maded of the electrophoresis aluminum-alloy, it is durable. 3. 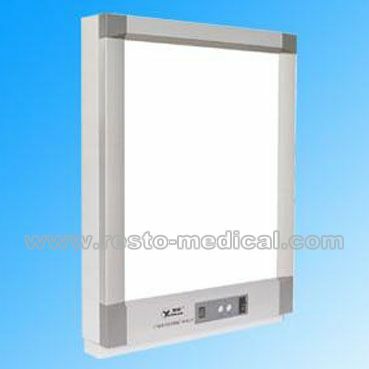 The screen is made of import white polymethyl methacrylate plate ,which is bright and clean. 4. Anti-ultraviolet ray, and never fade in color. 5. It is the first one to make the viewer body with aluminum-alloy to shape wholly in domestic. It is beautiful design. 6. The thickness is 8cm only, saving space. 7. The luminance of screen is brighter, the light is distributed evenly. 8. Adopting with general standard fluorescent lamp tube, easy to change.